I spent an hour today going through my stuffed binders of torn-out magazine recipes, assembling a menu for our annual New Year’s Day party. 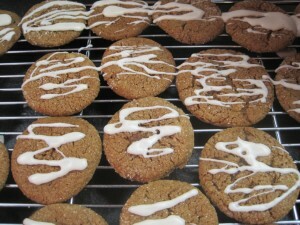 This cookie recipe is one I found in Sunset magazine four years ago and yet had never tried. Now it’s going to be a regular part of our holiday baking, because the cookies are easy, delicious, and pretty. 1. Preheat oven to 350°. In a large bowl, cream 1 cup granulated sugar with butter until light and fluffy, about 3 minutes. Mix in egg and molasses. 2. In a medium bowl, stir together flour, baking soda, and spices. Add to butter mixture and blend well. 3. Fill a shallow bowl with granulated sugar. Break off walnut-size pieces of dough and roll into balls; roll balls in sugar. Arrange on greased cookie sheets and bake until golden brown, about 10 minutes. Transfer to cooling racks. 4. Meanwhile, make glaze: Combine powdered sugar with 1 tbsp. water and stir until smooth, then stir in lemon juice. Drizzle glaze over cookies.